Weber's is a family-owned and operated restaurant that was started in June of 1933. Located in the heart of Brookside at 3817 S. Peoria, the oldest and longest-running business of any kind located in Brookside. Weber's Superior Root Beer was the creation of Oscar "Weber Bilby" back in the late 1800's. Oscar and his wife Fanny moved to Oklahoma from Missouri to a 640 acre farm just north of Sapulpa to an area now know as Bowden, Oklahoma in 1884. Oscar was a farmer but he enjoyed experimenting with different soft drink condiments. Through trial and error, he put together a secret recipe consisting of 14 natural ingredients which were "fire brewed" then stored and aged in birch bark barrels. His famous Weber's Superior Root beer was then served at the peak of the flavoring cycle. Oscar used yeast to carbonate his root beer. On the fourth of July, 1891, Oscar probably made his most significant contribution to society when he forged a piece of iron into a 3' x 4' grill. He then built a pit and heated the grill with hickory wood. His wife, Fanny, made sour dough buns while Oscar pattied up some black angus all-beef-patties and proceeded to grill the patties on his new hand-made grill. When they were cooked to perfection, he placed the patties between the buns...thus, the first real hamburger was made. He then served them (along with Weber's Superior Root beer, of course) to more than 100 people who were the Bilbys' friends and family. Oscar continued this 4th of July tradition every year for the rest of his life. His hamburgers and root beer were the hit of the community. 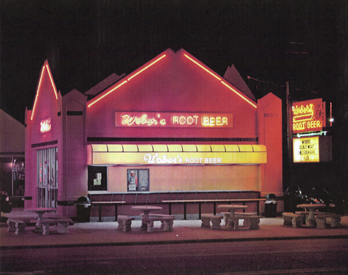 Decades of encouragement later, Oscar opened the first Weber's Superior Root beer Stand at 3817 S. Peoria. Oscar felt that the original stand should remain in the Bilby family forever. At the present time Oscar's great grandson Rick Bilby and his wife Jennifer own and operate the original Weber's Superior Root Beer Stand. In 1995 award-winning travel writer and reporter Michael Wallis (Route 66: the Mother Road) did an extensive nationwide search for the true origins of the hamburger as we know it. Later that year the Governor Frank Keating issued a statement of proclamation confirming Wallis's findings. It is with great pride that we cook our burgers on the original grill, made the same as they were in 1891, every day. Here at Weber's, our famous root beer is still made with those same 14 secret, all natural ingredients! We serve great tasting root beer in ice-cold frosted mugs. While visiting the original Weber's, please try an order of our famous homemade onion rings or our tasty fresh French fries. Our delicious hamburgers are still made from 100% fresh ground angus beef. The original Weber's is also home of Tulsa's best sausage cheeseburgers. if you like chili we invite you to try a wonderful chili cheeseburger, or a tasty cheeseburger. Weber's also makes delicious root beer floats served in ice-cold frosted mugs. Don't forget to purchase a Weber's Gift Certificate for that someone special! Gift certificates are also available.